^ Rain, Patricia; Lubinsky, Pesach (2011). 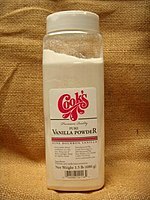 "Vanilla Use in Colonial Mexico and Traditional Totonac Vanilla Farming". In Odoux, Eric; Grisoni, Michel (eds.). Vanilla. USA: CRC Press. p. 252. ISBN 978-1-4200-8337-8. ^ Rain, Patricia; Lubinsky, Pesach (2011). "Vanilla Production in Mexico". In Odoux, Eric; Grisoni, Michel (eds.). Vanilla. USA: CRC Press. p. 336. ISBN 978-1-4200-8337-8. ^ Gigant, Rodolphe; Bory, Séverine; Grisoni, Michel; Besse, Pascal (2011). Grillo, Oscar; Venora, Gianfranco (eds.). The Dynamical Processes of Biodiversity - Case Studies of Evolution and Spatial Distribution. Croatia: InTech. pp. 1–26. ISBN 978-953-307-772-7. Archived from the original on 20 November 2016. Retrieved 20 November 2016. ^ a b c d e Frenkel, Chaim; Ranadive, Arvind S.; Vázquez, Javier Tochihuitl; Havkin-Frenkel, Daphna (2010). "Curing of Vanilla". In Havkin-Frenkel, Daphna; Belanger, Faith (eds.). Handbook of Vanilla Science and Technology. John Wiley & Sons. pp. 79–106 . ISBN 978-1-4443-2937-7. Archived from the original on |archive-url= requires |archive-date= (help). ^ K. Gassenheimer; E. Binggeli (2008). Imre Blank; Matthias Wüst; Chahan Yeretzian (eds.). 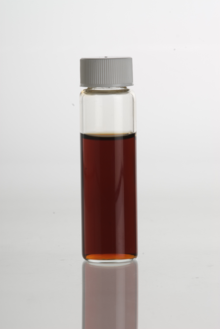 "Vanilla Bean Quality - A Flavour Industry View" in Expression of Multidisciplinary Flavour Science: Proceedings of the 12th Weurman Symposium (Interlaken, Switzerland 2008). Wädensil, Switzerland: Zürich University of Applied Sciences. pp. 203–206. ISBN 978-3-905745-19-1. ^ Kacungira, Nancy (19 August 2018). "Fighting the vanilla thieves of Madagascar". BBC. Retrieved 19 August 2018.